Freshwater AFS; Sidney Ernest Benham is in this group photo, in the middle row, either the second or fourth from left who are both Benham's. Sidney Ernest Benham passed away on 27 November 1970 aged 64. Sidney was born on 29 November 1905 in Freshwater, where he spent most of his life. His mother was Caroline and his father Harry was a plumber with his own business. At the time of the 1911 Census Sidney was the youngest of three sons, Reginald and Raymond the elders by five and six years respectively. Sidney was educated at All Saints School and after school assisted in his father's business, eventually taking it over with one of his brothers when Harry passed away in 1938. 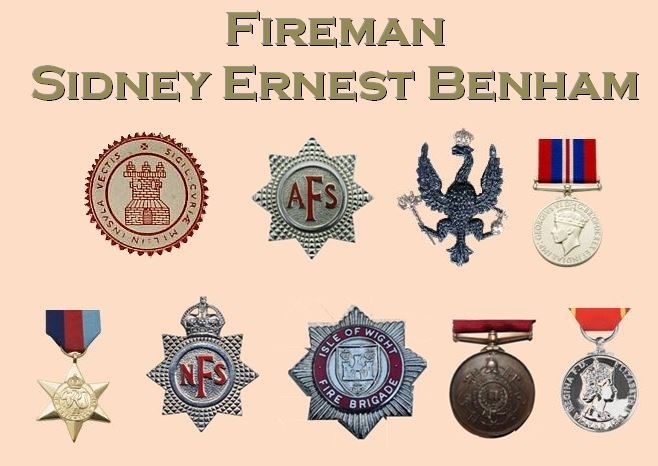 In the same year Sidney and Reginald both volunteered for the Freshwater section of the Auxiliary Fire Service. Sidney remained a batchelor throughout his life and the 1939 Register listed him living with Reginald and his wife Grace at Netherleigh, Victoria Road, Freshwater. At that time both brothers were working as house decorators in addition to part-time membership of the AFS. In April of 1941 Reginald was appointed Sub Officer of the Freshwater AFS but at some stage Sidney broke his service with the auxiliaries and joined the army, serving with the 14th/20th Kings Hussars serving in Sherman tanks in the Middle East and later in Italy. In 1945 the regiment gained the honour of the crossed kukris as a sleeve badge for its role alongside the 6th Gurkha Rifles during the capture of Medicina. 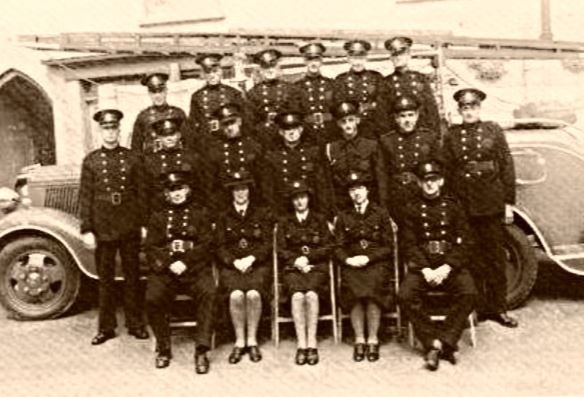 After the war Sidney returned home and resumed fire service activity, briefly with the local company of the post-war National Fire Service which in 1948 transformed to become Freshwater Fire Station of the Isle of Wight County Fire Brigade. On the day that the new fire station opened, 28 May 1960, before the unveiling of the plaque, Ald. Miss O'Conor presented Sidney with a Fire Brigade Long Service and Good Conduct Medal. On 6 January 1962 a dinner was held at the Royal Needles Hotel to celebrate the service and retirement of four members of the station, including Sidney. Sidney remained living with his brother and sister-in-law for the remainder of his life, maintaining a keen interest in sport throughout in addition to membership of the West Wight Rotary Club. He passed away at St Mary's Hospital two days before his 65th birthday. Rest in peace Fireman Benham.